Last month a new and super exciting company called Instajunction offered me the chance to review one of their (many) products. We like Instagram. And we like taking photos and sharing them with friends, and we like to print stuff. Not just boring stuff you can buy on the high street, but fun and exciting things that you want to carry around and show off to people all day long. So we brought together all these things we like and know into Instajunction, the greatest place to do something a bit more exiting with all those great looking pictures you’ve got squirrelled away on Instagram and Facebook? Quite simply, we put your Instagram, Facebook or uploaded pictures on a range of exciting and different products that you won’t find anywhere else – from sticker books to coasters, polaroid style cards to wall vinyls. Fantastic quality, speedy delivery anywhere in the world and all at sensible prices. The ordering process was super duper easy and took less than 5 minutes. Perfect for a busy girl like me! All you do is choose your product, select the photos you want and boom, you’re pretty much done! It can’t get any easier than that. I had my gorgeous print within a few days which was handy. The print arrived very carefully packaged and looked amazing!!! 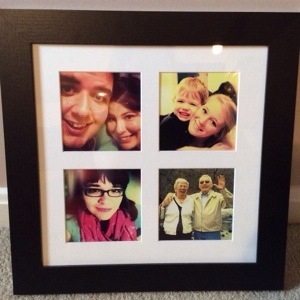 The black frame really set off and complimented the photos I chose for the piece. It didn’t look cheap at all but instead very high quality and lovely! My Memom was so thrilled with her gift and is busy clearing a space on her wall for it. Instajunction is now offering charm bracelets on their website… Something I’ve not seen any other Instagram based companies doing so I’m very impressed! I have a feeling I’ll have to try the bracelets next! NOW YOU can try out Instajunction for 25% off by using this special code at checkout: SKFRIEND25. Code expires on 8 December so hurry!! Leave me a note and let me know what you order! There are some super Christmas and stocking stuffer ideas going on through Instajunction… All very thoughtful! Instajunction offered the above product free of charge in exchange for an honest review.